My friend Jason found out his name meant “healer”. “Cool!”, I exclaimed. My friend Amber’s name meant “jewel”. “Wow!” My eyes scanned the pages as I frantically searched for my name in the listings. I imagined my namesake meaning “warrior” or “dragon-slayer” or something comparably fifth-grader cool. Finally, I found my name in a book taken from the bottom of the pile and excitedly read the following: Tyler - one who makes tiles. As we made the bookmark that served as the culminating art project in this brief lesson, I lazily wrote “maker of tiles” below the block letters spelling out my first name. Oh well, at least my last name is cool. Little did I know that 25 years later, I would be meeting actual tilers in Morocco, their clay creations absolutely blowing my mind and restoring my pride in the meaning scrawled on that meager bookmark ages ago. Tétouan, Morocco, the site of my recent residency at Green Olive Arts, also happens to be home to the Royal Artisan School. This stunning campus houses the only comprehensive program in Morocco that teaches the youth the traditional crafts that make this region so unique. 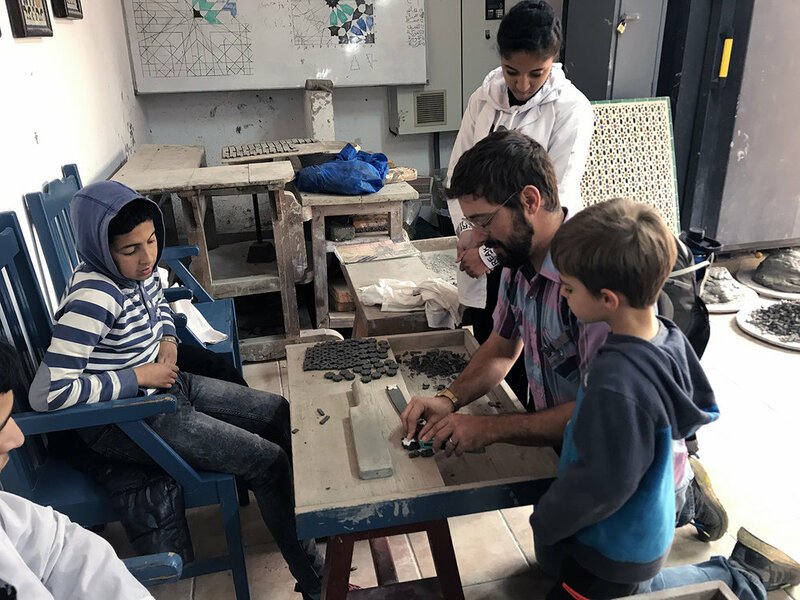 Wood and plaster carving, tile making, blacksmithing, embroidery, and decorative painting are among the skills offered here for free to Morocco’s youth. Many students enroll because they are struggling with traditional school; others come because they have a strong desire to learn a craft. Whatever the reason, the students here learn to become masters of their craft and the breath-taking results of the school’s storied alumni can be seen throughout the region. This was too big to fit in my suitcase but so amazing to see. All of it was carved BY HAND. Twice I visited the Royal Artisan School, transfixed by the amount of creativity and skill being honed in every classroom branching out from the picturesque courtyard. As I walked the grounds, I peered through arched doorways to see a handful of young students dutifully practicing their craft, every notch of wood or chunk of plaster bringing them that much closer to mastery. I would see the master craftsman leading the class, erect and dignified, his hands worn from decades of working the tools, his movements steady and deliberate, his mustache impeccable. This school is a big reason why the Moroccan crafts continue to achieve such a high level of enduring quality and I feel like I could have watched these makers for days. It was utterly fascinating. 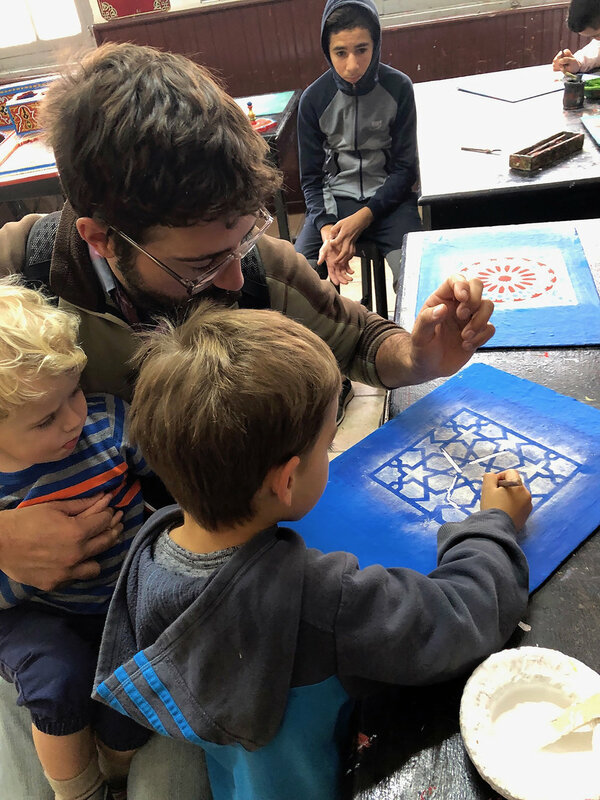 Every student at the school first learns how to draw the intricate geometric patterns that are the hallmark of Moroccan art. These complicated designs are hand-drawn using only a compass and a straight-edge. 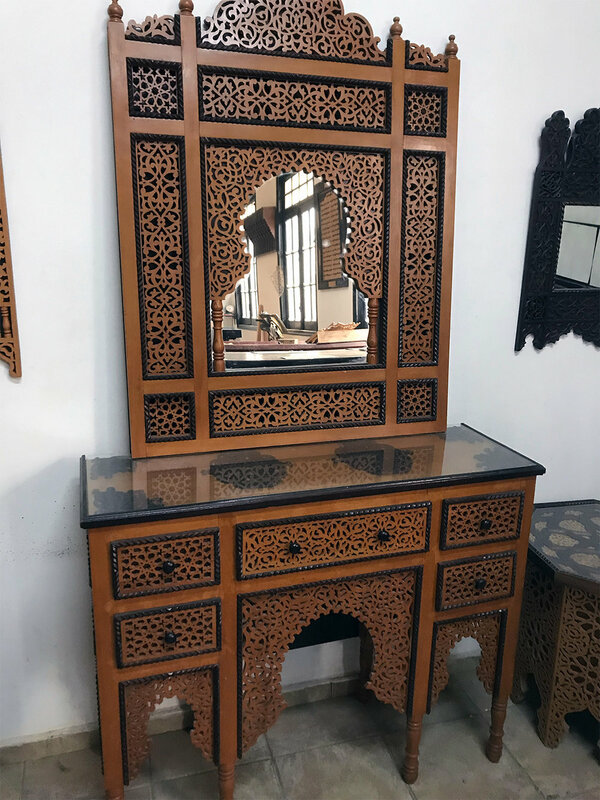 This is the basis for all of the other crafts, most notably the intricate interlocking tilework or “zellij” that can be seen throughout the region. When visiting Morocco and Southern Spain, my family and I were blown away by all the colorful and unbelievably precise tilework present in many of the buildings we visited. 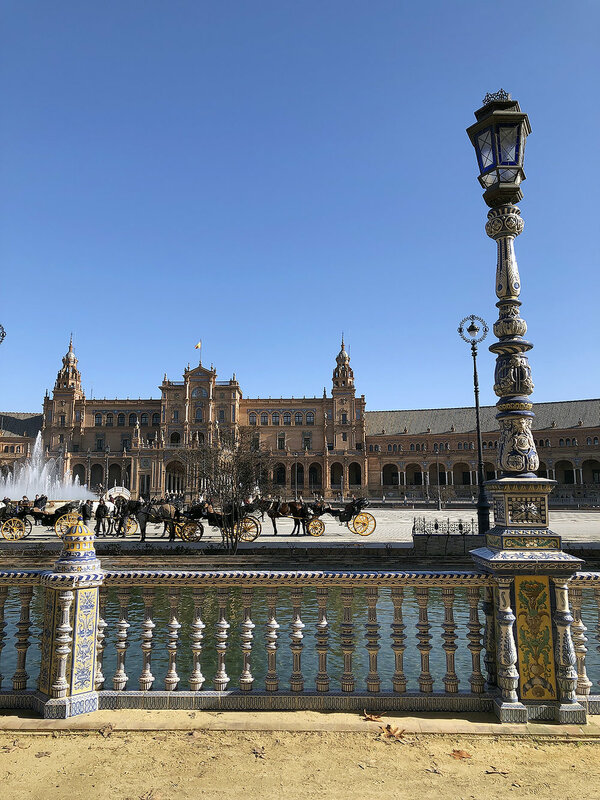 The Plaza de España in Seville, Spain is a massive plaza almost completely covered with individually cut and colored tiles carefully pieced together. The minarets (tall towers used to call Islamic worshipers to prayer) abutting the mosques in Morocco were all wrapped in ornate and vibrant tilework. Everywhere you turn, these mosaics adorn fountains, walkways, benches and tables and their craftsmanship is unparalleled. Back at the Royal Artisans School, I learned that the tilers of Tétouan (that’s got a nice ring to it) begin with a slab of wet clay that they harvest from the many clay pits in the area. They pound it flat and begin to trace and cut intricate shapes out of the wet clay using a dull knife. The individual pieces are quite small and must be cut to have a beveled edge so that they’ll fit together into ornate geometric patterns. When I watched the apprentice tilers, I was amazed at the speed and dexterity of their precise cuts, a skill honed by cutting thousands of tiles in their first few years of learning the trade. Once the tiny pieces are cut, they’re laid out and dried in a kiln. Next, each piece is a hand-dipped in a different color glaze according to the pattern they’re working. This sequence allows the tile to have a bulging middle with the glaze pooling at the edge of the tile face. Once the glaze is fired, it’s time to put the puzzle together upside down. The pieces are carefully laid out according to the pattern the tiler is creating, a painstaking process that takes incredible patience. Once the hundreds of tiles are put into place, they are first glued and then cemented together from the back. After the cement cures, the piece is turned over and cleaned to finally reveal the beauty of the pattern they’ve created. The tile work these master craftsman create is water and oil-resistant, making it a perfect building material for pools, fountains, baths, staircase steps and fireplaces along with wall covering or floor work. It has a such a pleasantly smooth texture to it and the color combinations they choose are a wonder in themselves. All in all, these tilers BLEW MY MIND. The colors and shapes were mesmerizing. Each piece is cut by hand and pieced together by a tiler. From the minarets of Morocco to the Alhambra of Granada, Spain, the work of these master tilers can be appreciated throughout the region. Their devotion to their craft and the thousands of hours they spend honing their skill are something that will have a lasting impression on this Tyler. Our Art Fair Adventure Tour 2019 begins next month in Dallas and Atlanta. Come see how the colors and stories of Morocco have influenced my latest work!